SINGAPORE - On Aug 9 at 9am, residents across Singapore will hear for the first time the voice of founding Prime Minister Lee Kuan Yew reading the Proclamation of Independence. The National Day broadcast of the document that declared Singapore "shall forever be a sovereign democratic and independent nation" will be preceded by the sounding of sirens across Singapore, said the People's Association (PA) in a media release on Friday. 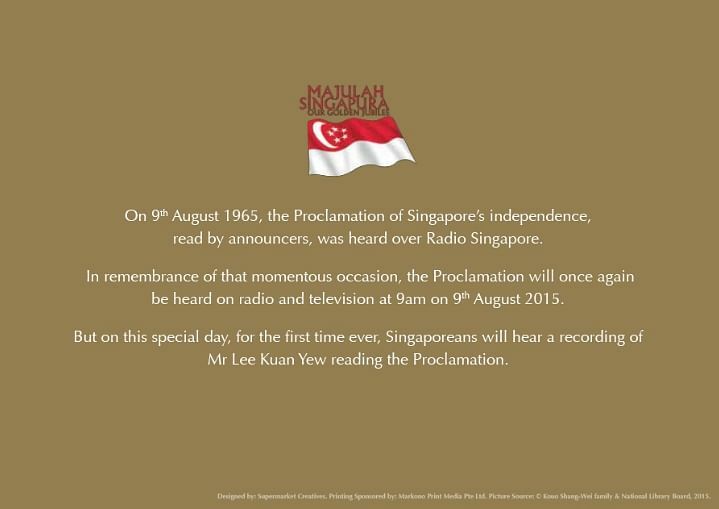 Mr Lee made the recording three years ago, as the original reading of the Proclamation over Radio Singapore 50 years ago was made by an announcer. The recording will be played on all local TV and radio channels and heard at 82 National Day Observance Ceremonies organised by the PA's grassroots organisations. More than 30 ceremonies are also being organised by corporate and community organisations ranging from supermarket chains to voluntary welfare organisations. Over 500,000 residents will take part in the events at over 200 locations islandwide. Many of the events will include kampong scenes and activities to recreate what the moment of the Proclamation of Independence was like for the pioneers. It is the first time that all the observance ceremonies will be held on the same day at the same time, said the PA.
"The Proclamation of Independence in 1965 marked the birth of our nation," said PA chief executive director Ang Hak Seng, in a statement. "The reading of this Proclamation by our founding Prime Minister Mr Lee Kuan Yew will remind us of the core values that our pioneers embodied, such as community resilience, racial harmony, determination to overcome the odds and placing community above," he said. All households will receive a card with the text of the Proclamation of Independence in their SG Funpacks.